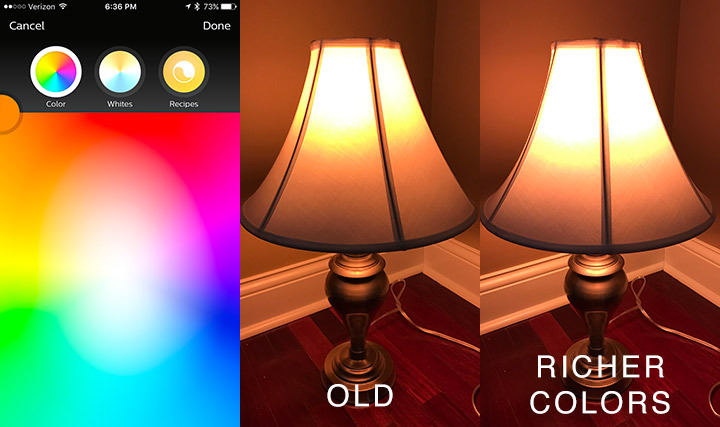 When we reviewed Philips’ Hue 2.0 system this summer, we were blown away by its versatility and unbelievable support for almost every platform, but slightly disappointed by the limited color range of its bulbs. 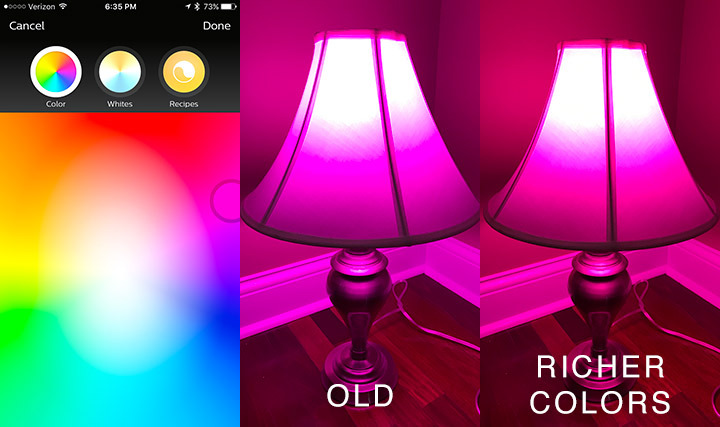 Competing products like the LIFX line can produce vibrant shades across the full color spectrum, but the Hue bulbs unexpectedly struggled with greens, light blues, and a few other frequently used tones. 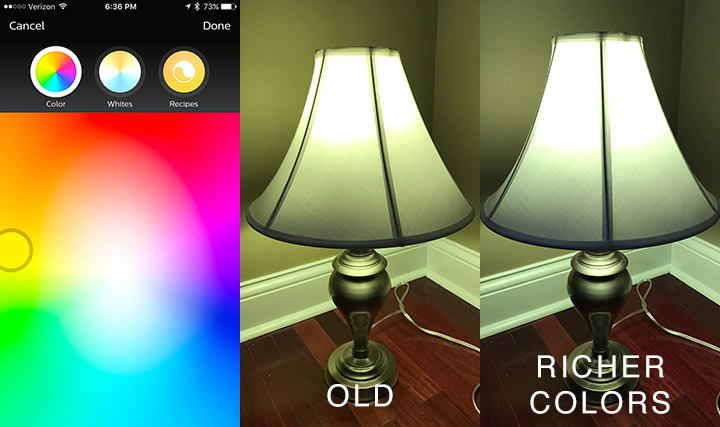 For that reason, I was elated when Philips announced a refreshed bulb lineup for the fall that features what they describe as simply “richer colors.” I was able to get my hands on one early to see if it can improve on what is pretty much the only drawback I found in the Hue system. Do the new bulbs actually make a difference? 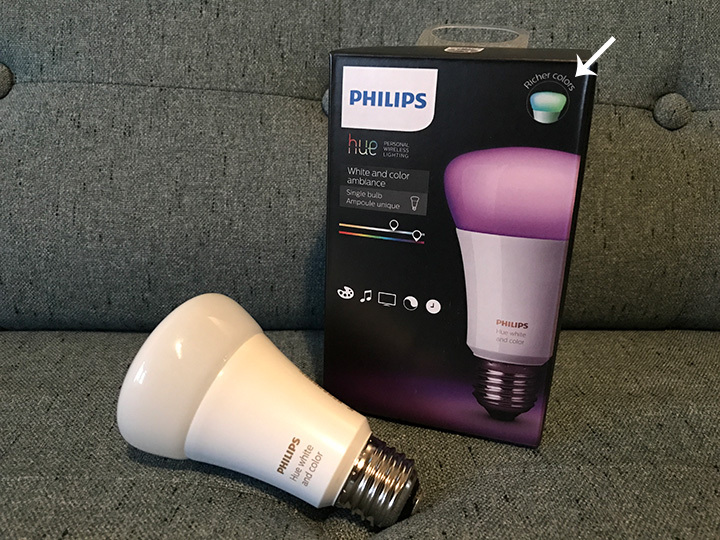 Honestly, they perform so much better that I feel like Philips is making a mistake by highlighting the feature as a footnote (notice the small label on the top of their packaging) rather than rebranding the bulbs entirely. 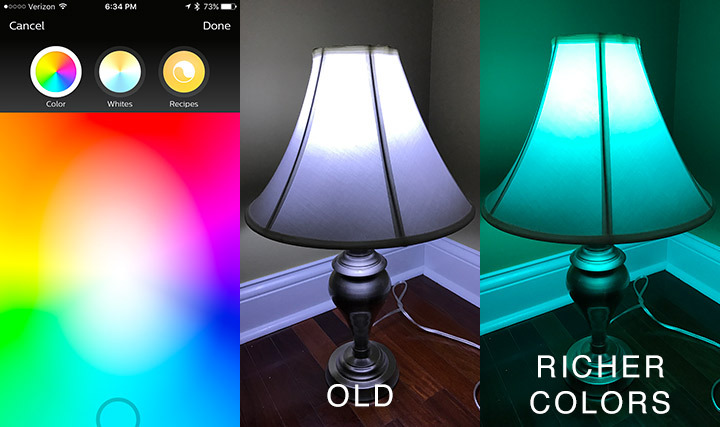 If you use the current Hue White and Color Ambiance bulbs (not the lightstrip plus or other products, which already have a wide color range), you’re familiar with choosing a color on the palette, only to have the app move the selector to a less vibrant shade of that color (due to the bulb’s limitations). With the “richer colors” bulbs, the selector stays on the exact color you chose, giving you a much wider spectrum to choose from. I could drone on about this, but I figured you’d want to see the difference for yourself as you consider upgrading your own bulbs. Here are some side-by-side comparisons I shot with my iPhone 7; I tried to get the exposure as accurate as possible to what I was seeing with my eyes, but read the descriptions below where I’ll explain the differences. 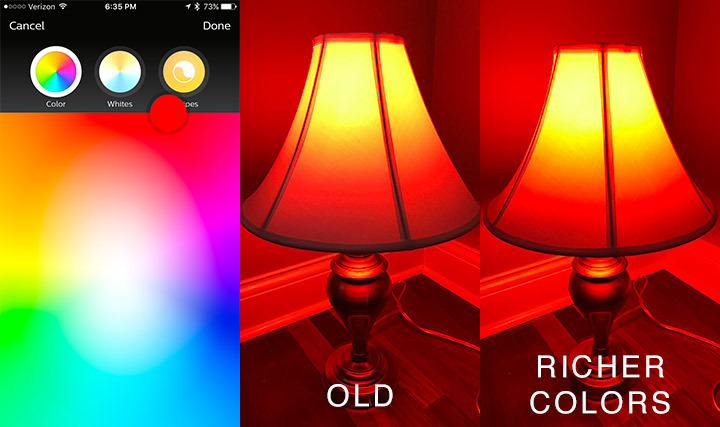 No difference here; the previous bulbs and richer color bulbs both show rich shades of red. 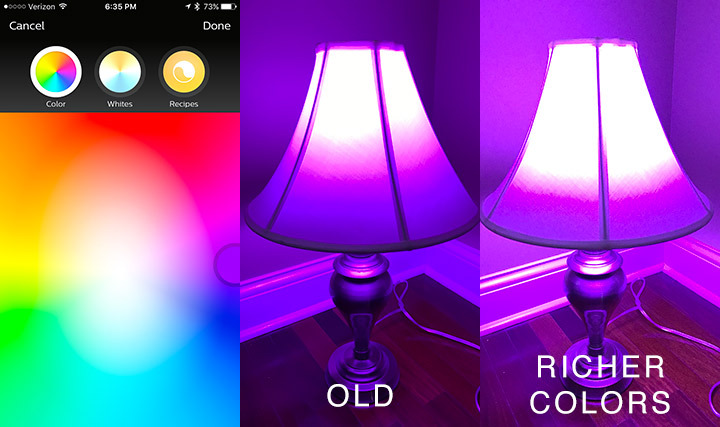 No difference here; the previous bulbs and richer color bulbs both show vibrant shades of pink. There’s a slight difference here that may not come across in the photos; the purple from the richer colors bulbs is a little less harsh in person. Another slight difference; I feel like the blue is a little less dominant in the richer colors bulbs… I actually found it easier on my eyes in person. This is the first color where the richer colors bulbs start to make a name for themselves. Wheras the previous bulbs appear to be just a cooler shade of white in person, the light blue comes through with the richer colors bulb. Again, the richer color bulbs create a beautiful aqua colored light here, where the previous bulbs just produce an odd shade of white. The previous bulbs could barely display any shade of green, so the richer colors bulbs are a revelation here. 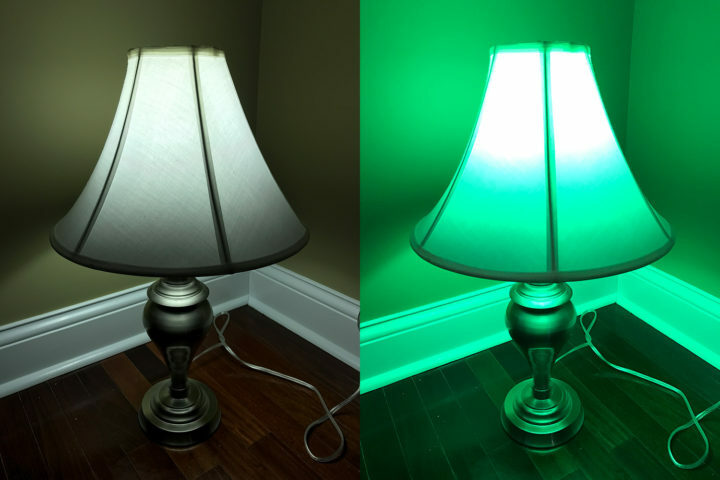 It’s hard to tell from these photos, but the richer colors bulbs produce a rich shade of green, wheras “green” is mostly a tone of yellow with the previous bulbs. Neither bulb photographed well here (I think the iPhone is compensating for white balance), but both bulbs produce a nice golden yellow glow. Both bulbs produce about the same shade of orange, which is much more vibrant in person than what was photographed here. The new richer colors Hue bulbs are a huge improvement on their previous bulbs, faithfully reproducing every color I threw their way. 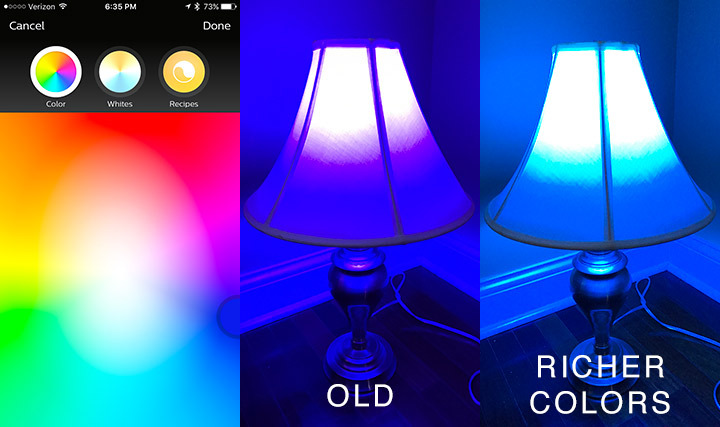 To my eyes, the LIFX bulbs still produce slightly more vibrant colors (that can look almost neon to the eyes), but the new Hue bulbs are excellent. If you had any reservations about going all-in on Hue, the new bulbs with richer colors should push you over the edge. 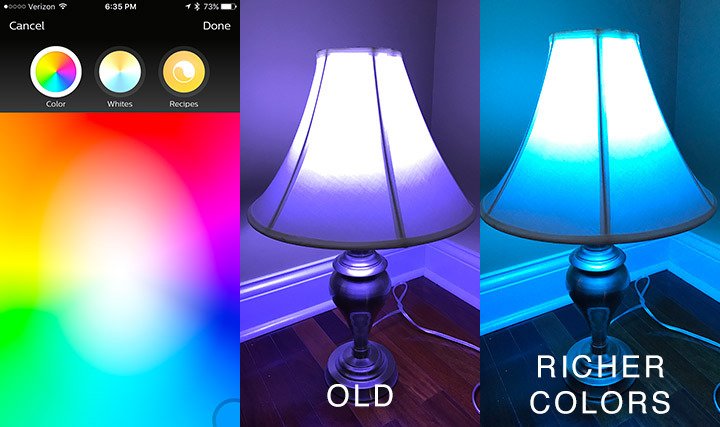 Note: The new bulbs should start making it to store shelves this October (at a new price – $49.99!). To make sure you’re getting the new model, look for the small “Richer Colors” icon in the top right corner of the packaging. Is the iPhone Still the Best Phone? 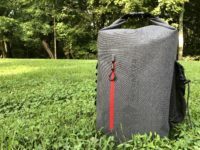 thx for your great article! 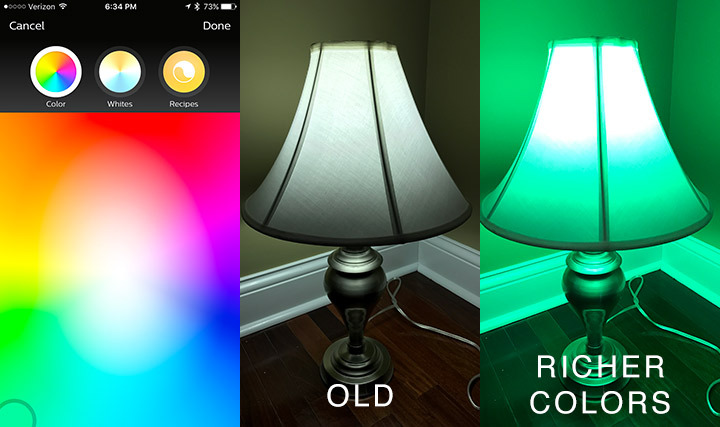 Do you know if the new Hue bulbs with richer colors are already on the market? I am from Germany and want to buy the starterset but cannot find any information if its the new version. I think there’s some limited availability in the US right now, but not sure about Europe. Worth the wait! I am in a similar situation, except I want them shipped to Poland. 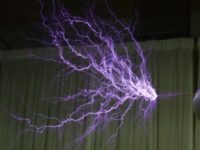 They are available on Amazon.co.uk and are designated with “richer colours”, but are in short supply at the moment. Amazon.de seems to still carry the old ones unfortunately. 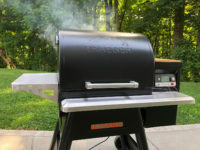 They way to tell them apart is to look for where the metal screw meets the base. Old ones have a plastic ring there, while new are smooth. You could actually point that out in your article Eric, as it took me a while to notice that. Note that if you paste the UK product code into the German URL you’ll get the page for the new model, including information in German about improved green etc., it’ll just say they are unavailable at the moment. The best way to tell them apart is the packaging… just look for the “Richer Colors” logo in the top right corner. They’re definitely worth the wait; I feel like there’s literally no drawback to the Hue line now. thank you a lot for this comparison! 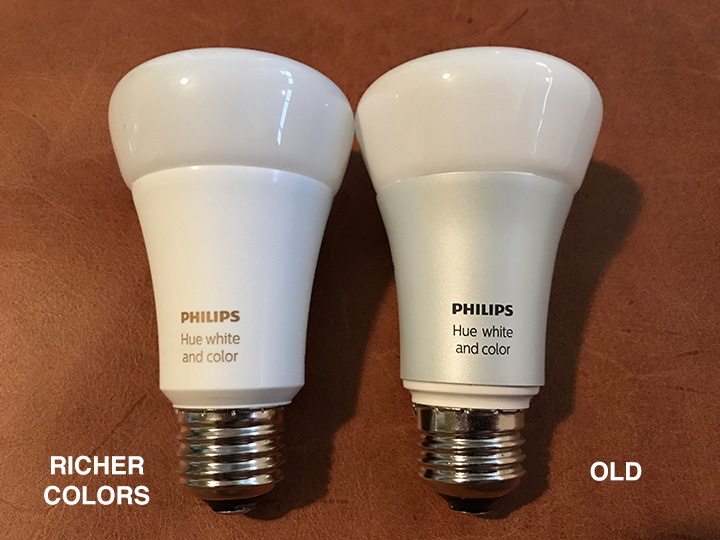 Sadly I head to read in an Amazon review, that the new richer color bulbs perform a significant colder “warm white” than the older bulbs. Unfortunately I’m missing the comparison of the white in your test. Can you please tell me something about that? How many generations hue bulbs are there at the moment? On https://www.philipshue.nl/ was nothing to find about this…. I’ve just bought the third generation bulb lights and the colors are very well! 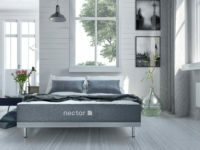 On https://www.hueaanbieding.nl/ i find soms great deals. But sometimes you can be better buy it from Amazon. Only it takes a couple of weeks when it arrived in the Netherlands.